As long as you are Marvel fans, you would not miss the Avengers series. Since the first movie The Avengers presented in 2012, now the second one Avengers: Age of Ultron came on May 1, 2015. All the heros would come together to fight the evil. 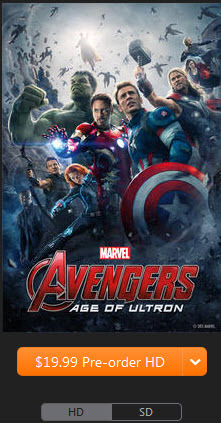 The Avengers (2012) is already available to buy or rent in iTunes store, and Avengers: Age of Ultron is still in pre-order situation. The article would help you convert the purchased or rented The Avengers series movies to plain video formats for playing on non-Apple devices as well. The Avengers: Earth's mightiest heroes must come together and learn to fight as a team if they are to stop the mischievous Loki and his alien army from enslaving humanity. Avengers: Age of Ultron: When Tony Stark and Bruce Banner try to jump-start a dormant peacekeeping program called Ultron, things go horribly wrong and it's up to Earth's Mightiest Heroes to stop the villainous Ultron from enacting his terrible plans. Avengers 3: Of course, it would come. It is just the time matter. Iron Man, Captain America, Thor, the Incredible Hulk, Black Widow and Hawkeye, those your favorite Mightest heros, will not let you down in the Avengers. 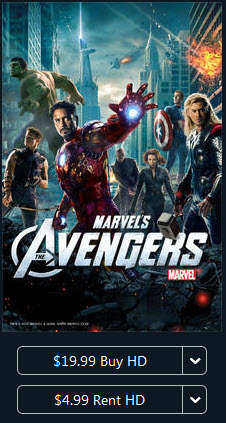 After you purchase or rent the Avangers from iTunes store, you can simply watch it in iTunes through your computer. Or you could use your iPhone or iPad to enjoy the iTunes movie under the same Apple ID. What else? The iTunes movie the Avengers can't be played on other devices due to the DRM protection on iTunes media content. If you intent to watch The Avengers from iTunes store on non-Apple device such as Samesung phones, tablets, PS4, Xbox, M4VGear is of great help. 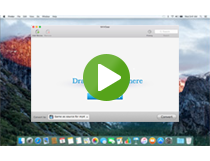 It is the best DRM media converter program for Windows and Mac that allows users to take their iTunes media out of Apple’s closed-off ecosystem. Tutorial: How to Transfer The Avengers from iTunes to non-Apple Devices with M4VGear DRM Media Converter? 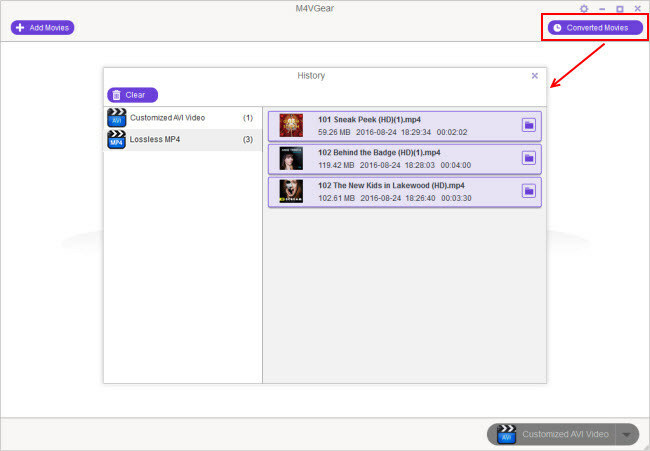 Step 1: Click "Add Movies" button on the upper left or in the middle of the program to add iTunes M4V movie to the M4VGear main interface. Step 2: Choose the output format on the lower right of interface. Note: To keep all subtitles and all audio tracks (including AC3 5.1 audio), we suggest you choose "Lossless MP4" as output format. Step 3: Click Lossless MP4 button to start converting DRM-ed iTunes video to unprotected format. Step 4: Find the converted movie The Avengers by clicking "Converted Movies" to check the file. 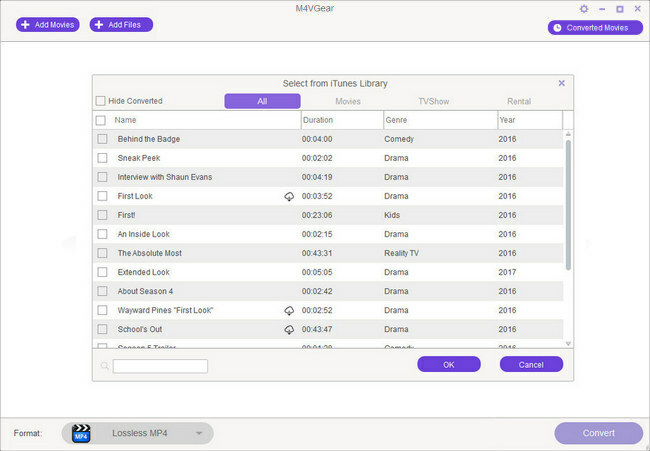 The output video converted by M4VGear can be directly transferred to non-Apple devices for playback via cable. It is so simple and fast to enjoy the converted iTunes movie The Avengers on portable devices you have. 1. M4VGear can clip video length for converting if you just want a certain part of the iTunes movie. 2. 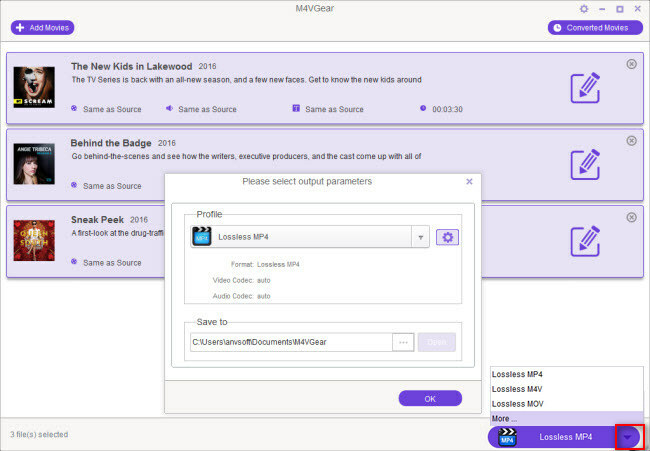 M4VGear for Mac supports converting iTunes Extras. It is one of the unique features. 3. The trial version of M4VGear allows 1 minute free conversion. Now, get M4VGear full version at $44.95 (original $49.95) and enjoy life-time free updates and free tech supports. The film is a work of craft, from the actors like Mr. Downey, who can deliver a comic line with the timing of a mouse trap, to the editors, Jeffrey Ford and Lisa Lassek, upon whom so much of the movie’s very elegant fluidity rests: The way they dovetail a reaction shot, sight gag or casual bon mot with the stentorian declarations about mission, teamwork, unity and aliens keeps the movie buoyant, rather than bogged down by narrative baggage (as the 2012 movie often seemed to be).